Aztlán: ancestral home of the Aztecs. Wage fierce battle to be the one tribe among four that will stay in this mythical paradise. Coexist? Or be banished forever! Players choose a tribe and take all of the pawns of that tribes color. Each tribe also has a set of 6 power cards (numbered 4-9). Once the board is set up, a small Aztec pyramid in the player color is placed on the “0” of the scoring track that circles the game board. One gray Aztec pyramid is placed on the first space to signify the beginning of the first age. The first player is chosen randomly and players in turn order place one of their pawns on a turn order track. The first age begins. Choosing Phase: Each player chooses one of their remaining Power cards and places it face down in front of them. The Power Card defines the strength of each player’s warriors with a numerical value between 4-9. It also has one icon and background that matches one of the five territories on the board. This will score the player bonus points in a later round. Development Phase: Each player in turn places one pawn in any territory on the board; either empty or occupied by their own or rival tribe’s pawns. Each player also has the option to move one of the pawns into an adjacent territory. This is repeated until all players’ pawns are placed. The number of pawns a player has depends on the number of players and the age. In the first age of a 4-player game, every player has seven pawns to place. In the second age, six pawns are placed. And so on down to 3 pawns in the 5th age. Now, all players flip their chosen power card, which reveals the Power of all the tribes for this age. Battle simply involves removing all the tribe pawns of the player with the lower power. Coexistence allows the losing player to keep their pawns on the board. But the winning player gets to draw a Prosperity card. More on those later. After all players have resolved all conflict in order from highest scoring player to lowest, the Conflict phase ends. Scoring Phase:Again in order of the highest scoring player to the lowest. Players calculate their score for this age. Players look at each of their “Domains,” which are a series of adjacent territories. Players score one point for each territory in each Domain they have – even if their pawns share a territory with a rival tribes pawns. In addition, bonus points are scored for each territory that matches the territory on that player’s chosen Power card. At the end of the Scoring phase. Player order is determined by score, with the highest scoring player going first. The turn marker is moved to the next age and a new age begins. Each subsequent age is played out in this order. After the fifth age, one last scoring opportunity presents itself. The Power card that players did NOT choose during the game may have a bonus point value on it. Each player totals these points if any and the player with the most points wins! The initial attraction to this game begins and ends with the art. Drew Baker has imbibed the game with colorful, vivid and immersive Aztec art. Although the game board is, at times a bit convoluted with color, this is a beautiful game. The pawns and cards are all of top quality. The small Aztec pyramids used for scoring are cool even if a bit small. Very easy to learn and get playing as the game’s strategy and depth emerge as game play evolves. A very good game for younger players to experience “euro-type” mechanics using conflict with no violence. In fact, the positive choice to coexist rewards players with powerful play options. This is a 4-player strategy game and doesn’t lend itself to a party of social atmosphere. In this dice-free, territory control game, strategy begins from the first turn. Your game is decided by your choices and not random factors. It’s a great strategic game. Plays very quickly and offers many replay options based on player interaction and the unique Prosperity cards. Not too deep, and once played, will inspire a repeat play immediately. This is one of Colovini’s best. And any fan of his games must try Aztlán. His design efforts culminate in this simple elegant game. Avid gamers will enjoy it! Many strategies emerge as the game progresses but none are as intriguing as the coexist versus battle mechanic. This may offer Power gamers something new. But it will depend on individual tastes. What we have in Aztlán is a very accessible game that feels like a Euro and plays like an abstract strategy game. The “Euro” feel is dictated by area control, the limited play time and the dice free combat system. The abstract strategy comes from the very simple game turns: place a pawn and move a pawn. Where the game transcends both game types is the fact that the game forces players into some very interesting strategic choices. This is due to several unique aspects that set this game apart. The first is your choice of Power card. Each Power card dictates the power of your tribe for that turn, and all players have the same cards. Also, in choosing this card you eliminate it from use in later turns. Power cards also have a territory bonus on them, which may inspire you to place your tribe pawns in certain territories to score the most points. But beware, although hidden, other players can see your pawn placement and will no doubt attempt to occupy the same territories to create a conflict. Finally, each Power card has a VP bonus that might be scored at the end of the game if unused. The higher the power on the card, the higher bonus you will receive. And so your Power cards are your main resource. You only have six to choose from and must be played efficiently to earn a victory. Your other resource are your tribe pawns. Obviously placing pawns in adjacent territories that build your domain and score you more points. But you must choose to occupy and try to hold a territory, or place in an already occupied territory in order to create a conflict. Eventually, players are forced into conflict. You soon run out of territories and as your strategy unfolds, you must confront other tribes. In addition, the challenging and unique aspect of Development is that in each age you have less and less tribe pawns to place. (From 7 in the first age to 3 in the fifth age.) This creates the feeling that as the ages progress you tribe is less and less expendable – ramping up the intensity forcing you to make better strategic choices. You may need to avoid conflict early on as your supply of pawns gradually diminishes. But conflict is often unavoidable. If a conflict arises, the player who has the higher power has a choice. Eliminate the enemy pawns, or coexist and draw a Prosperity card. It may sound like an easy choice, tribe pans mean more power and more territory, but coexisting grants you a Prosperity card and Prosperity cards can give you a huge advantage. Most Prosperity cards provide bonus VPs. Several other cards provide in game advantages like placing and extra pawn or granting you a win in a tied conflict. The Prosperity cards you draw could mean victory. Scoring in the game is also unique. Most obvious is players are rewarded if they control more adjacent territory. Less obvious is the fact that bonuses are awarded for territories pictured on your chosen power card. And since you territories can change hands a few times in a game – this is more difficult than it sounds. The 4 power card has a unique ability. Of course it grants you the lowest power for the turn, but during the scoring phase, you can name a territory type that gives you the bonus. Lastly, as mentioned, unused Power cards award VP bonus adding another level of strategic choice in the Choosing Phase. These several aspects of scoring create a specific tension for each player as they access their options for the turn and how to maximize their VP potential. Overall, The game is simple enough to learn in minutes and can offer repeated strategic and tactical challenges all in under 45 minutes. The game is almost instantly playable due to the simple game turns. The strategic choices you make in the first two ages will often dictate your success in the game in subsequent turns. But with a limited game time (only 5 turns), limited resources and a map that seems to grow smaller with each turn, every decision you make is crucial. The game is fast, taxing and unforgiving. Just like the ancient Aztec! Aztlán can be played by three or four players (or two players with the "Aztec Gods" variant). In a multi-player game, each player guides one of the four tribes. A game is divided into five stages, called ages; at the beginning of each age, each player secretly chooses one of his power cards, and then one at a time places a certain number of his tribe pawns in one of the territories on the game board, which is divided into five different types of territory: deserts, terraced fields, jungles, mountains/volcanoes, and cities. The power card chosen for the age indicates the strength of that player's tribe and identifies one type of territory (of the five different types). The greater the domains of that player, and the greater the number of territories of that type included within them, the higher the victory point score. 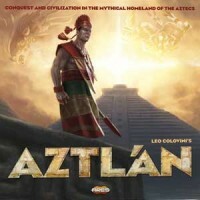 Add a Review for "Aztlán"